Five days before the Wentworth byelection, when Liberal candidate Dave Sharma was starting to claw back support in the seat Prime Minister Scott Morrison was desperate to save, Facebook and Twitter lit up with a warning: if local doctor Kerryn Phelps doesn’t come second, the Liberals win. 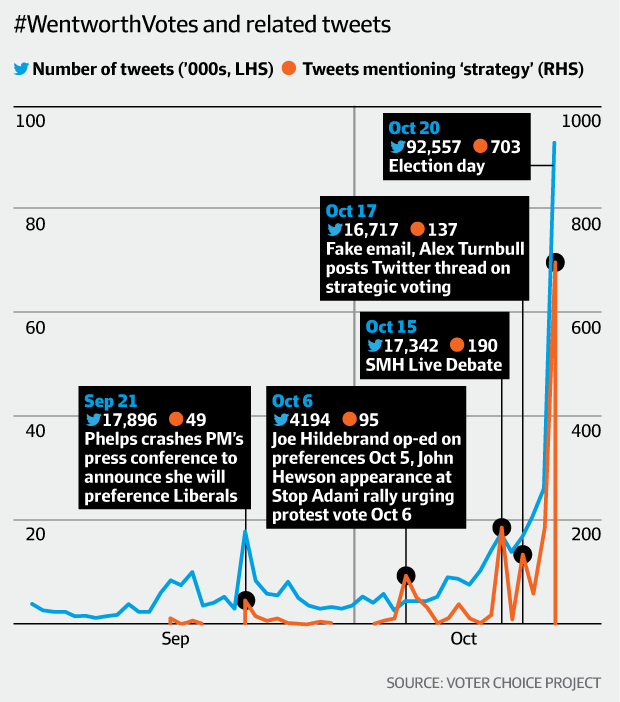 Pushed by the GetUp campaign group and amplified by Phelps and her supporters, the tactical-voting message may have marked a turning point in Australian politics: the moment social media played a decisive role in a major election. Politics used to be fought in town halls, in workplaces and over barbecues. The battle for one of the most prized Liberal seats in the country was waged on the internet as much as in the physical world. On Facebook pages and in tweets – about 380,000 messages were shared over the last month of the campaign – voters in the wealthy Sydney electorate discussed and argued about the best way to ensure the Liberal Party would lose. Based on surveys of Wentworth voters, Raphaella Kathryn Crosby, a non-partisan election specialist who runs the Voter Choice Project, concludes that information, opinion and conversations on Facebook and Twitter were more likely, than any other media, to convince voters to switch candidates. Controlled by political bureaucracies relying on decades of traditional campaign practice, Sharma and Labor’s Tim Murray weren’t equipped to fight on the new battleground. 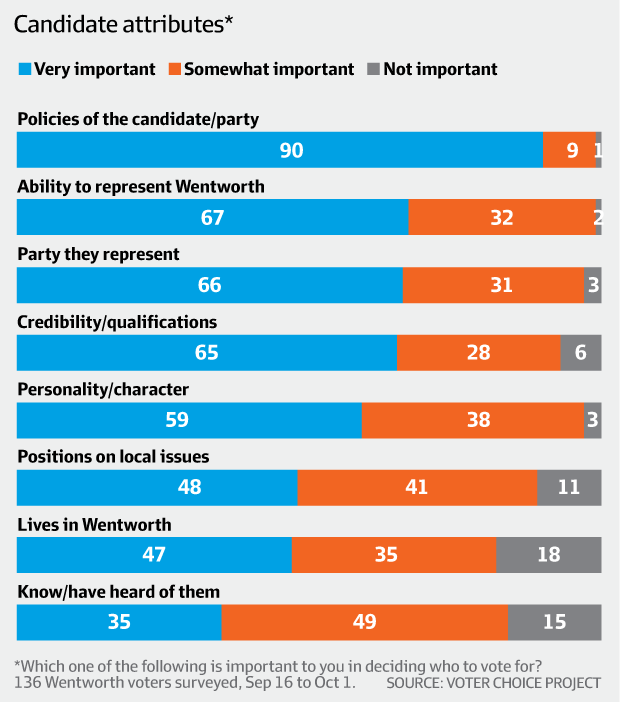 Wentworth serves as a powerful warning to the Coalition government. It demonstrated how GetUp and other political organisations can tactically coordinate with the Labor Party to shake the Liberals’ grip on their safest seats, even when they pour huge resources into the fight. It will be good to hear from @DaveSharma his views on it. The feeling in Wentworth is the Libs are going to get punished. The election created unusual alliances. The Liberal Party tried to help the inexperienced Murray. Sharma’s campaign refrained from attacking its Labor opponent, hoping that he could come at least third in the primary vote, and overtake Phelps with preferences from Greens voters. If Murray made the final two, Phelps’ preferences would win the seat for Sharma, preserving the Coalition’s parliamentary majority, Liberal strategists knew. GetUp and Phelps understood the strategy, and they reckoned they could negate it. Online, they pushed an almost-endless argument at voters: the former president of the doctors’ union is the only one who can beat the Liberals. day 16, no answer on twitter from @DaveSharma. more than 500,000 impressions on these tweets. on the back of latest #IPCC report, why is dave choosing to make his non-response on social media an issue?
. @DaveSharma best of luck in your campaign. Social media conversations about “strategic voting” started to accelerate on Monday, October 15, and built up over the following days, Crosby says. Long-time Labor and Greens supporters, centrist businesspeople and the undecided slotted in behind the local GP. Even people who didn’t like Phelps decided to vote for her. Support began to melt away for Murray, who had been close to Phelps in early voting. At the same time, Sharma was being defined by his opponents. Wealthy climate-advocate Simon Holmes a Court hammered him over the government’s environment policies. Sydney Morning Herald columnist Peter FitzSimons pushed him to oppose a horse-racing promotion on the Sydney Opera House – a state decision. Sharma needed permission from the Liberal Party head office to tweet or post on Facebook. The restriction was ironic for the former diplomat. As an ambassador to Israel from 2013 to 2017, he had pushed for greater social media advocacy to reach out to Palestinians and Jews. While the Liberal and Labor candidates were kept quiet, online, Phelps was liberally projecting her outsider persona into the forums where voters were working through who to vote for. She waded into Facebook groups, taking on critics directly and rallying supporters. Online, Phelps deployed a level of aggression and sarcasm – often in response to mild criticism – that might have been considered rude in person. “Sometimes I wish there was a dislike button,” she wrote. “Nothing in my track record would suggest that your assertion could be even vaguely approaching true. “Crazy conspiracy theory number 534. “What don’t you understand about I am standing in Wentworth to win the seat FROM the Liberals? Phelps’ supporters trolled and shouted down people who suggested she wasn’t the only candidate who could beat Sharma. None was more active than Margo Kingston, a former Herald political reporter who runs her own blog. Kingston sent and retweeted 1526 messages on Twitter about the campaign, many of them designed to convince non-Liberal voters to back Phelps. When a Labor Party member, Mick Minion, argued that Phelps wouldn’t be able to influence the government’s climate policy, Kingston urged tactical voting. Another anti-Liberal voter called Bernie Cox then complained that Phelps was a Liberal “stooge” who wouldn’t vote to remove the Coalition government. Murray spent the last Sunday of the campaign walking around the electorate asking people for their vote, face to face. Labor supporters told him they would put him second, but they were going to vote for Phelps to punish the government. In the last week, 39 per cent of Murray’s supporters deserted him – most went to Phelps, according to a study by Crosby. Sharma only lost 3 per cent of his. The three-contender contest turned into two, Sharma and Phelps. Then the embassy in Israel dropped. On October 16, four days before election day, Scott Morrison proposed relocating the Australian embassy from Tel Aviv to Jerusalem. The Trump-inspired suggestion completely reshaped the election dynamic. Murray had planned an announcement that day combining Indigenous recognition and tourism that he planned to campaign on the whole last week. The policy never came out. Sharma, whose Indian heritage meant he was sometimes mistaken for Jewish, had pushed the embassy switch before he became the Liberal candidate. But that was part of a long-term cosying up to the Jewish community, who make up about 12 per cent of the seat, according to census data. Sharma’s campaign concluded the embassy idea – which deeply upset Palestinians – was perceived to be so nakedly political that it cost more votes in the broader community than it may have won over. Seventy-one per cent of Wentworth’s Jews voted for Sharma anyway, according to an exit poll carried out by Crosby. The embassy backfire compounded the electorate’s great underlying resentment: the removal of its high-status local MP. Sharma heard it everywhere he went. People didn’t hold back. “I’m not going to vote for you this time because of what they did to Turnbull but you can have my vote next time,” was a common message, according a Liberal source. Turnbull’s son, Alex, initially praised the Labor candidate, then endorsed Phelps in a laptop video shot from his home in Singapore. The Sharma campaign waited for a word or gesture of support from Manhattan, where Turnbull and his wife Lucy were conducting shopping forays from their Central Park apartment. The ex-prime minister’s physical presence would have been welcomed, despite drawing attention to another leader’s removal. Even a tweet would have helped. “If he was visible it would have said, ‘Malcolm’s OK with this’,” one Liberal says. The Liberals didn’t lack resources. Sharma’s face dotted the electorate. There were often four Liberal volunteers on polling booths to Labor’s two. One Liberal Party source estimated it spent in the “high six figures” fighting the byelection. For every two Labor or Greens volunteers on a polling booth, there were often two from GetUp. They handed out pamphlets printed with multiple how-to-vote lists, giving voters a handy guide what to do if they supported Labor, the Greens and several independents. Some volunteers told voters the pamphlet was a compilation of the candidates’ how-to-vote cards. It wasn’t. The preferences had been allocated by GetUp’s shadowy leaders, and were designed to funnel all non-Liberal preferences to Phelps. One independent candidate, former fund manager Licia Heath, had chosen an “open ticket” – she didn’t allocate preferences to anyone. On GetUp’s how-to-vote card, her preferences went to Phelps. “I do wonder how GetUp feels after this; how they feel they might be viewed, particularly by the Wentworth GetUp community,” Heath says. GetUp argues that the preference allocation was a demonstration of its political independence. “Voters don’t need the permission of a candidate to choose their own preference order,” a GetUp spokeswoman says. Not everyone in GetUp was fine being on the Phelps team. At a meeting in Bondi on October 3 to sign up volunteers, the news they were expected to campaign for the wealthy doctor shocked and angered some, according to a person present, former Sydney City councillor and environmental activist Michael Mobbs. Critics assert that GetUp, which has about 70 paid employees, is an unacknowledged arm of the union movement and Labor Party, a claim the group denies. Either way, GetUp’s early realisation that campaigning for Phelps would be an effective way to defeat Sharma demonstrated its political sophistication. “GetUp is beholden to nothing other than our work to build a more fair, flourishing and just Australia for all,” its spokeswoman says. GetUp wasn’t Phelps’ only outside advocate. The Wilderness Society carpeted the electorate with posters alleging the government was controlled by the coal industry. Flashmob-like anti-Adani coal mine activists ambushed Sharma and tried to disrupt his campaign events. Some Liberals still believe choosing a male candidate from outside the electorate was a mistake. Crosby’s research found almost half of voters regarded local residence as very important. Sharma was from Sydney’s north shore, although he has since relocated to Wentworth. Despite internal polling showing Sharma was at one stage losing by 59 to 41 per cent, he came within 1.2 percentage points of victory, just 1783 votes. On election night, Murray, who suffered a 6 per cent swing against him, got a call from Labor leader Bill Shorten, who hadn’t appeared in the seat once. Sharma and Murray plan to challenge Phelps at the general election. Aaron Patrick at the AFR, writes on News specialising in Politics, Industrial Relations and Economy. Based in the Sydney newsroom, Aaron has over 20 years experience as a journalist.